Leftover Ham and Great Northern Beans, cooked on the stovetop in a big soup pot like my Mother cooked her's. A crockpot is a great option to cook them, but remember they take less time to cook than pinto beans. The upside--you get to enjoy all those juices quicker with a big slab of cornbread. Our Christmas ham this year was super delicious, and the first thing we always look forward to is cooking the ham bone in a pot of beans. In fact, it never gets frozen. Straight to the pot it went with some Great Northern Beans. Mother was an old school cook using the simple conveniences that were available. 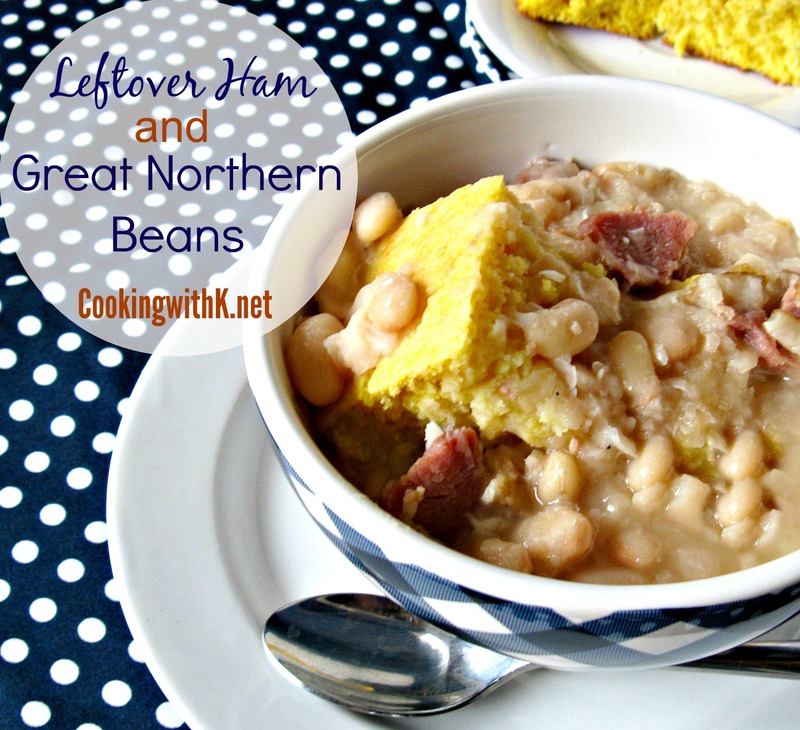 She used the ham bone to build the flavor in the beans and followed up with salt and pepper to taste. I started adding a chopped onion at the end of cooking the beans that bump up the flavors. 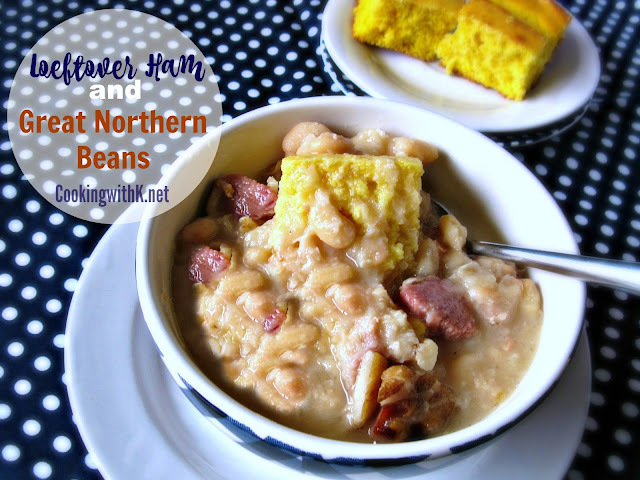 These Leftover Ham and Great Northern Beans are close to soup or stew, thick and creamy, just what comfort food is all about! You will want to make some of these the next time you have leftover ham with a ham bone! Enjoy! In a large pot, add beans and cover with water. On medium high heat, bring to a boil. Turn heat to medium low heat and cook until tender, about 4-6 hours*(see Cook's Note). Add chopped onions and cook 30 minutes longer. Salt and pepper to taste. Serve with a pan of cornbread. 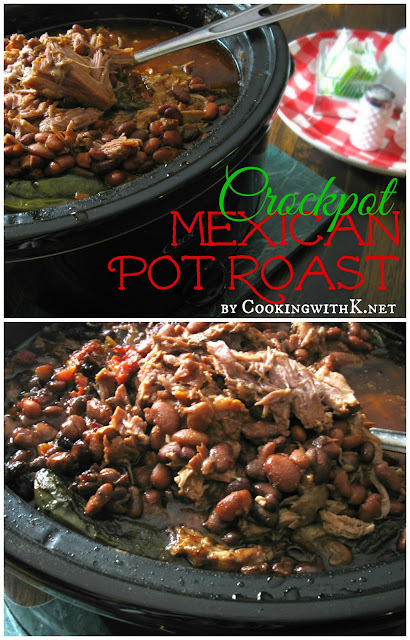 Cook's Notes: The beans can be cooked in a crockpot on low for 6-8 hours. My Mother always salted and peppered her beans after they cooked. The ham has some salt in it, so this was to avoid them from being too salty. Thanks for stopping Eric…enjoy the weekend!! Beans and cornbread are on a Mediterranean diet…there you go :) thanks for stopping by…love hearing from you! Kay, this looks delicious- I'm a big fan of ham and beans! The navy polka dots and checks in your photos are so cute! 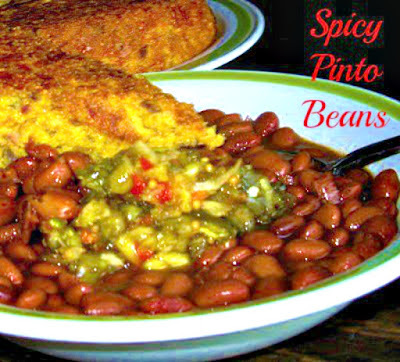 We both LOVE this simple dish and enjoyed it a couple of times over the holidays! Yours looks sooo yummy, as I'm sure it is. Thanks so much for sharing at Weekend Potluck. Keep coming back...please! One of my daughters would love this!!! Her favorite things are ham and beans! Thanks for linking to the Weekend re-Treat Link Party! xo, S.
This looks like such a cozy and comforting meal! And I still have some leftover Christmas ham in the freezer! This looks so good! I love old school cooking. This looks delicious. Thanks for linking to the In and Out of the Kitchen Link Party. Hope to see you next week.